In Missouri & Illinois, Clarity Healthcare provides various behavioral health services. 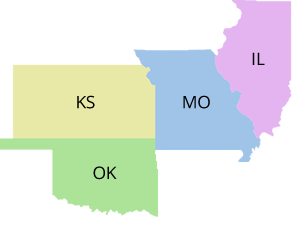 In Missouri, Community Psychiatric Rehabilitation covers 21 counties and services adults and adolescents with a serious mental illness (SMI). With physical locations in Hannibal, Kirksville, and Trenton, we offer day programs while also operating a Residential Care Facility in Kirksville. In Oklahoma, Dayspring Community Services operates behavioral health clinics offering a variety of services; however, our professional staff can also be found in schools, homes, and settings throughout our service area. We also offer extensive bilingual services (Se habla español). Do not deny access to services due to an inability to pay. The services and help we receive from the staff have been phenomenal to the success in our lives.